Scientists have found fossil-like hints that some kind of life existed on Earth 4.1 billion years ago - when the planet was a mere volcanic toddler. 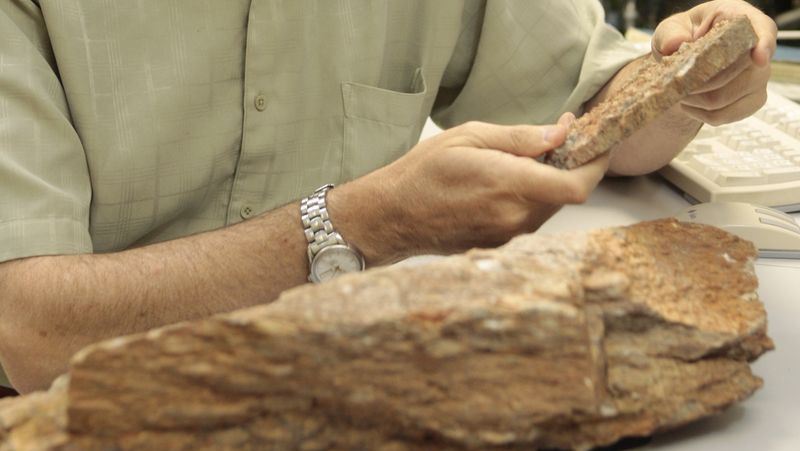 That's 300 million years earlier for life to pop up than previously thought. "Twenty years ago, this would have been heretical," Mark Harrison, co-author of the research and a professor of geochemistry at UCLA, said in a statement. Researchers examined tiny grains of the mineral zircon from western Australia's Jack Hills and chemically dated them to when Earth was barely 400 million years old. Inside one of the 160 some grains they found what they call a "chemo-fossil" or a certain mix of carbon isotopes, according to a study published Monday in the journal Proceedings of the National Academy of Sciences. Think of it as "the gooey remains of biotic life or anything more complicated," said Harrison. The common thinking of early volcanic Earth is that it was too molten and there was not enough liquid water for life to take hold this early. But, Harrison said, there's no physical evidence for this theory. Far from the "hellish, dry, boiling planet" we might picture, early Earth was probably much more like it is now. What the zircon shows is "the Earth by 4.1, 4.2 billion years ago was basically behaving like it is today." "This is what transformative science is all about," said Stephen Mojzsis, a University of Colorado scientist who wasn't part of the research. "'If life is responsible for these signatures, it arrives fast and early." S. Blair Hedges of Temple University, who also wasn't part of the study, said Harrison's findings makes sense and the accelerated timeline of life fits with his genetic tracking work.